Wyburn–Mason syndrome is associated with unilateral retinal racemose hemangioma. Rarely, it presents with bilateral and symmetrical grade of malformation. We describe a 37-year old male, who presented with Wyburn–Mason syndrome presenting with bilateral but asymmetrical retinal hemangioma. The eye with advanced grade of hemangioma was complicated with exudation, intraretinal fluid, neurosensory detachment, and reduced vision. He was treated with one intravitreal injection of bevacizumab, after which both the intraretinal fluid and neurosensory detachment resolved. His vision improved and was maintained till 1 year of follow-up. Wyburn–Mason syndrome is a rare, congenitally acquired, vascular malformation., It is characterized by direct artery-to-vein communication in retina and ipsilateral central nervous system.,,,, Archer et al. classified the retinal arteriovenous malformations (AVMs), also called retinal racemose hemangioma, into three grades according to their severity. Grade I lesions are characterized by AV communications with abnormal capillary plexus, whereas grade II lesions lack a capillary bed. In grade III lesions, distinction between artery and veins becomes impossible. The most characteristic feature of this malformation is its unilaterality., Only few cases of bilateral involvement have also been reported in literature. All these cases presented with a symmetrical grade of retinal hemangioma.,, We describe clinical features and management of a patient with Wyburn–Mason syndrome who presented with bilateral but asymmetrical grade of retinal racemose hemangioma. A 37-year-old male presented with complaint of decreased vision in right eye for 4 months. His systemic history was unremarkable. Best-corrected visual acuity (BCVA) in right eye was 20/60 and left eye was 20/20. Ocular examination revealed round and normal reacting pupils with no relative afferent pupillary defect and parallel visual axes. Anterior segment examination in both the eyes was unremarkable. Posterior segment examination showed dilated and tortuous vessels with AV communication in both the eyes with hard exudates in the macular region in the right eye [Figure 1]a and [Figure 1]b. While the AVMs in right eye were of grade II, AVMs present in left eye were of grade I. The periphery was normal in both the eyes. Fluorescein fundus angiography (FFA) showed normal arm-to-retina time and rapid transit time in both the eyes, non-leaky retinal AV communications in the left eye [Figure 1]c, and late leakage in the perifoveal area in the right eye [Figure 1]d. Magnetic resonance neurogram finding included tortuous vertebral arteries in close approximation with left-side complex of cranial nerves VII and VIII [Figure 2]a and bilateral multiple tiny cavernous and capillary hemangiomas in supra- and infratentorial compartments with predominant involvement of brainstem and cerebellum [Figure 2]b. Hence, the patient was diagnosed with incomplete Wyburn–Mason syndrome. Optical coherence tomography examination showed hyporeflective lesions in the inner retinal layers of the perifoveal and peripapillary region suggestive of dilated vessels in both the eyes [Figure 3]a; hyperreflective lesions suggestive of hard exudates, intraretinal edema, and neurosensory detachment involving the fovea in the right eye [Figure 3]b; while the left eye showed no macular edema [Figure 3]c.
The patient underwent one intravitreal injection of bevacizumab (IVB, 1.25 mg/0.05 mL) in his right eye. One month after the injection, BCVA in his right eye improved to 20/30. Both the intra- and subretinal fluid resolved and the exudates reduced. At 1-year follow-up, the patient maintained his BCVA at 20/30, while there was no recurrence of macular edema [Figure 3]d. The vision did not improve completely because of the presence of hard exudate clumps in the outer layers of the fovea. We presented clinical findings of a patient with Wyburn–Mason syndrome and bilateral retinal racemose hemangioma. After a thorough search, we could find only eight cases of bilateral retinal hemangioma.,, All the described cases had a symmetrical grade of retinal AVM in each eye. However, our patient presented with different grade of AVM in both the eyes. Second, these AVMs are usually stable without any signs of leakage on FFA.,,,,, However, in this case the eye with the higher grade of AVM was complicated by exudation, macular edema, and decreased vision, and the FFA showed late leakage in the perifoveal area. Various modalities of treatment for the intraretinal and subretinal fluid in racemose hemangioma have been described by different authors [Table 1]. We investigated the role of intravitreal bevacizumab in the management of macular edema associated with retinal racemose hemangioma. Both intraretinal and subretinal fluid in our patient responded well to a single dose of IVB. The effect was maintained for 1 year, that is, the last date of follow-up. The exact mechanism through which bevacizumab reduces macular edema in these AVMs is unknown. It can be either due to the drug's ability to decrease the vascular permeability or due to its ability to reduce the number of dysplastic vessels., The limitation of this case study is the absence of a long-term follow-up, which can help us understand the natural course of the patient. It would be interesting to know whether the AVMs in the second eye also become decompensated. IVB seems to be a safe and effective option for the treatment of maculopathy associated with retinal racemose hemangioma. Schmidt D, Pache M, Schumacher M. The congenital unilateral retinocephalic vascular malformation syndrome (Bonnet-Dechaume-Blanc syndrome or Wyburn-Mason syndrome): Review of the literature. Surv Ophthalmol 2008;53:227-49. Chuang LH, Wang NK, Chen YP, Wu WC, Lai CC. 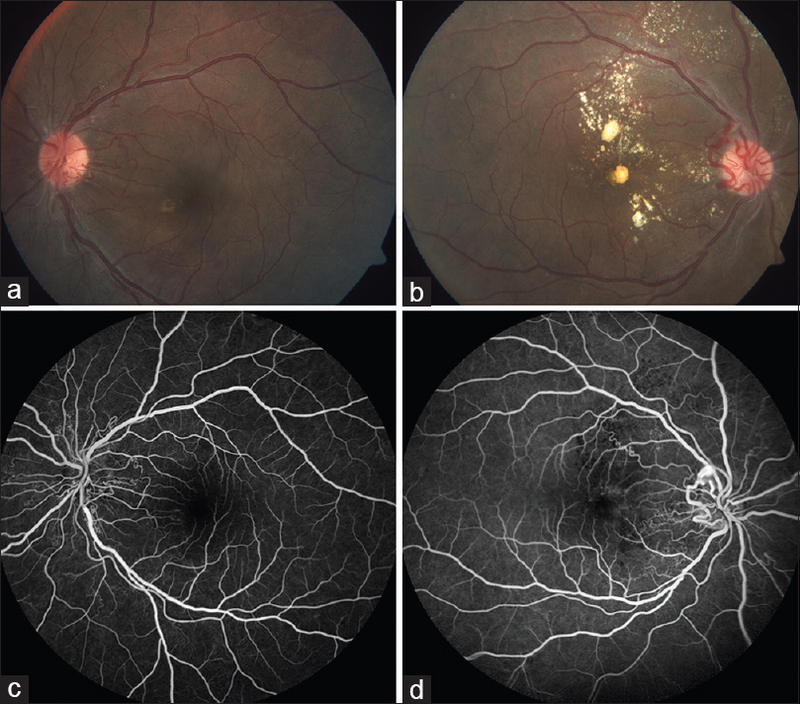 Mature vessel occlusion after anti-VEGF treatment in a retinal arteriovenous malformation. BMC Ophthalmol 2013;13:60. Archer DB, Deutman A, Ernest JT, Krill AE. Arteriovenous communications of the retina. Am J Ophthalmol 1973;75:224-41. Barreira AK Jr, Nakashima AF, Takahashi VK, Marques GA, Minelli T, Santo AM. Retinal racemose hemangioma with focal macular involvement. Retin Cases Brief Rep 2016;10:52-4. Soliman W, Haamann P, Larsen M. Exudation, response to photocoagulation and spontaneous remission in a case of bilateral racemose haemangioma. Acta Ophthalmol Scand 2006;84:429-31. Kaliki S, Tyagi M, Kumar HP. Bilateral peripapillary racemose hemangioma: An unusual presentation. Ophthalmology 2016;123:323. Onder HI, Alisan S, Tunc M. Serous retinal detachment and cystoid macular edema in a patient with Wyburn-Mason syndrome. Semin Ophthalmol 2015;30:154-6. 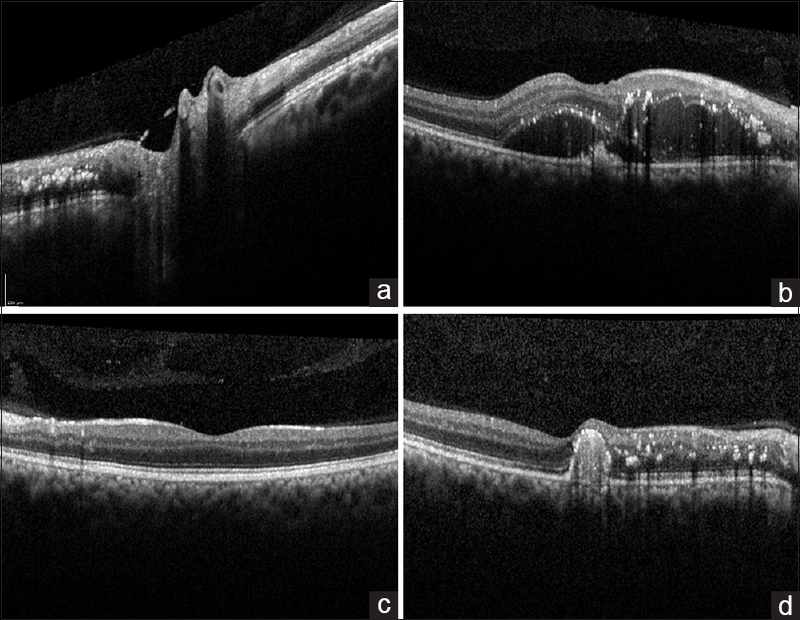 Winter E, Elsås T, Austeng D. Anti-VEGF treating macular oedema caused by retinal arteriovenous malformation – A case report. Acta Ophthalmol 2014;92:192-3. Walker EJ, Su H, Shen F, Degos V, Amend G, Jun K, et al. Bevacizumab attenuates VEGF-induced angiogenesis and vascular malformations in the adult mouse brain. Stroke 2012;43:1925-30.